I think we all scrubbed up rather nicely! Jason (aka the Hunk, now the Hubby) was looking super spiffy in his new suit (civil engineering contractors don’t generally have much call for for fancy-pants menswear), I wore a simple (and stretchy) frock to accommodate the baby bump and even Mr Puppy Doo-hawg agreed to a shampoo and blow wave (well, a wash and a dry roll in the dusty gravel on the driveway at least). We had wonderful weather, the garden looked gorgeous, the guests ate, drank and were merry, and it all went off without a hitch. I adored my big bouquet of colourful mixed dahlias from Davina at Vida Flores. Davina added a funky off-centre trail of asparagus fern studded with wee Bells of Ireland (Molucella laevis). I’ve always loved their stately lime green spires but have never managed to grow them successfully, so that’s on my to-do list to master next season. I’ll order seeds to sow from Kings Seeds and, green fingers crossed, they’ll be in bloom by this time next year. 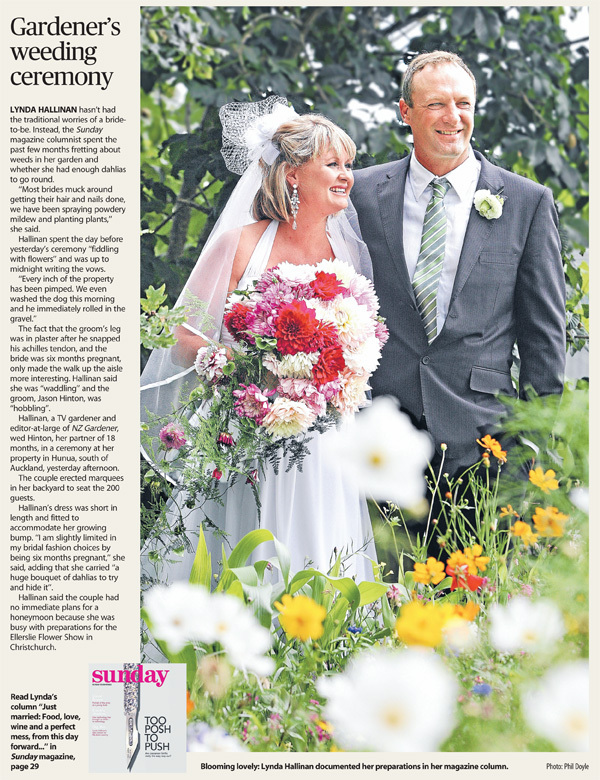 The Sunday Star Times also snapped a nice pic of the pair of us standing in the middle of the wildflower border. You can read their story here. Congrats!!!! You both look amazing and I have looked at the photos of the garden and they blew me away. I wish you both all the happiness in the world!! Now you need to sit down, relax, put your feet up (with a ginger beer) for at least a week, your ankles and baby will thank you for it I am sure. You look gorgeous.. very best wishes to you both.. Thank you Lynda – yes he IS a hunk … no wonder your mum and dad worked so hard to make a perfect day for the perfect couple… you both look so happy . and the bump was well disguised…going to be a looker the baby with all those genes in its favour.. thanks for sharing your preparations, and the lovely wedding shots..
What a fantastic day and a fantastic garden. The hours of toil, sweat and errant animals must all seem so worth it now. Congrats to you both. The new baby is also going to love toddling around on the lawn in time and you will definately need a tent for shade – great reasons to keep them I think. You all look wonderful & I think we might have to stick with ‘The Hunk’ he sure is one!! Congratulations to both of you – you guys looked amazing and all the hard work you put into your gardens certainly paid off!!! Love the pic with the pup – it almost looks like he is begging for Jason’s beer lol! All the best for your new life together! Wow, looks like the PERFECT day. I love all of your amazing personal touches. Everything looks beautiful. Congratulations! Wow! 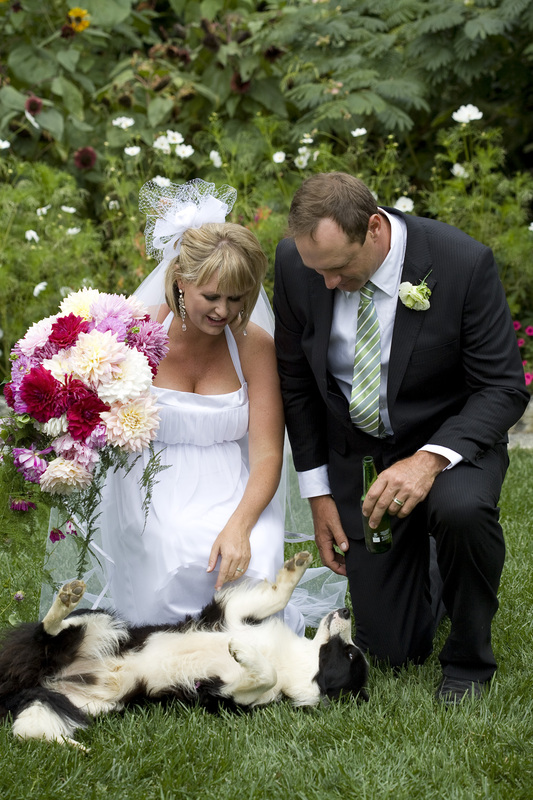 Stunning bride, handsome groom and gorgeous gardens! Wishing you and Hunk every happiness for the future and all the best with your pregnancy and baby. Yep, he’s certainly a hunk! The dog looks cute and gorgeous, the garden is Fantastic………and you look pretty gorgeous yourself. Have a wonderful life. I look forward to reading lots more about you and your growing family. Congratulations you all look fabulous. Thank you for sharing your photos a great highlight to see them. I was just thinking.. your wedding will be the most known of and celebrated of all.. shared and followed by all of us throughout New Zealand, including in the Trademe Get Growing thread.. Thanks for sharing it all with us all..
Congratulations on all you have accomplished and planned to make the perfect wedding day.I have enjoyed following the stages of progress with lots of inspiration showing what can be done. Lynda you looked beautiful and Jason (the Hunk) looks to be the perfect match and along with baby to look forward to and a puppy wow you counldnt ask for anything more. Loved the wedding bouquet of dahlias.I give you 10 out of 10. What a wonderful day you had, you both make a lovely couple and thankyou for sharing your wedding with us all.Good luck to you both. Congrats to you both. What a beautiful day you both had. The dahlias in your boquet were beautiful. Loved how the arrangements looked on the table too. Was the punch from Mrs B’s cookbook? Wow…..love, love, love. What a fab day – can’t wait to see pics of this much waited on bubs now! Congrats to you both! Wow, the dahlias worked, you looked beautiful and the Hunk was well, a hunk! Best wishes for a fabulous loving life with never a dull moment. You both look fabulous and your garden and tent were wonderful. Lynda and Jason, we wish you a happy future together. You certainly have had your highs and lows, starting with your shed fire ,losing precious seeds and other belongings, Jason and his ‘archiles tendon’, heavy rain,and puppy and hens thinking your garden was for them to destroy,—- but you came through it all smiling and Lynda you looked beautiful. You look after yourself and rest so you have a safe arrival of your wee man?Loved your bouquet and garden and allthat made your day what it was. Gay.